Last night's concert in Costa Rica was unbelievable! You guys were fantastic and I am a happy woman today! My body hurts from jumping and dancing, and my throat hurts from singing and screaming, my hands arms and hands hurt from clapping.... but what sweet pain! Thank you so much for coming to Costa Rica! This was truly a dream come true! Amazing sound, amazing band, amazing music and AMAZING MAN! THANK YOU AND PLEASE COME BACK! We Love your music!!!!! It's SOUNDS FOR THE SOUL! anyone has any pics to share??? Last edited by Sandriche on Mon Apr 03, 2006 6:34 pm, edited 1 time in total. amazing concert! even if the night was cold i enjoyed it a lot.. jay k is the best frontman ever, but the band was great too.. the time we waited to start, was worth it.. best concert ive been to and the best there was! THANX JAMIROQUAI! how many people were there??? THXXXXXXXXXXXXXXXXXXXXXXXXXXXXXXXXXXXXXX GUYS !!!! For giving me the BEST NIGHT OF MY LIFE !!!!!!!!!!!!!!!!!!!!!!! BY FARRRRRRRRRRR !!!! Hope you have a next time here in CR, your home !!!!!!!!!!!! COSTA RICA LOVES YOU JAMORIQUAI!!!!!!!! Last edited by jambee on Mon Apr 03, 2006 5:05 pm, edited 1 time in total. Incredible outfit!!!! Jay estaba demasiado con ese poncho y el sombrero....sale con un poncho igual al de el disco "The reurn of the space cowboy!!!! SerÃƒÂ¡ que ya yo habÃƒÂ­a tocado mi retirada? You must come back one day!!! Please!!! jay is definetely a showman, he knows how to get us dancing and jumping!! i loved the way the whole thing started, i think its one of the best songs to start with and put us jumping from the first 5 senconds till lights went of, & of course if it wasnt for the band it would not be the same, you guys are brilliant on your music, so deliciously funky!! the feeling this party gave me, made me feel alive!! thank you guys, best show ever, hope to see you some day again!! this saturday was the best day of my life i can't believe that i went to that concert. no me lo podia creer ni mi hermano ni mi cuÃƒÂ±ada y my friend paul fue exelente la presentacion se me pusieron los pelos de punta cuando vi a JK en el escenario, increible en ratos hasta se me hiva la respiracion espero q se vuelva a repetir. I absolutely love this picture. This is the best picture I have seen of this tour..Those kids are so adorable and those are the best parents ever. Pump their brains with Jamiroquai early, so they will grow up to carry on the music of our boys. Thanks for posting this..I love it! THIS deserves to be a single cover or something! All the pics are great actually! Last edited by deesh on Mon Apr 03, 2006 10:20 pm, edited 1 time in total. I agree that's why I posted it and that's why when I saw this family I asked them for the picture because it was one of those things you never see and you have to capture the moment...... Jay Kay at some point of the concert told to the guy that was filming to film them because he obviously loved them too!! THANKS JAMIROQUAI for thinking in a very small but beautiful country COSTA RICA and giving us the best night ever! COME BACK COME BACK!!! NO PUDO HABER SIDO MEJOR!!!! Yo casi lloro cuando JAY KAY salio brincando no se de donde pero ahi salio. 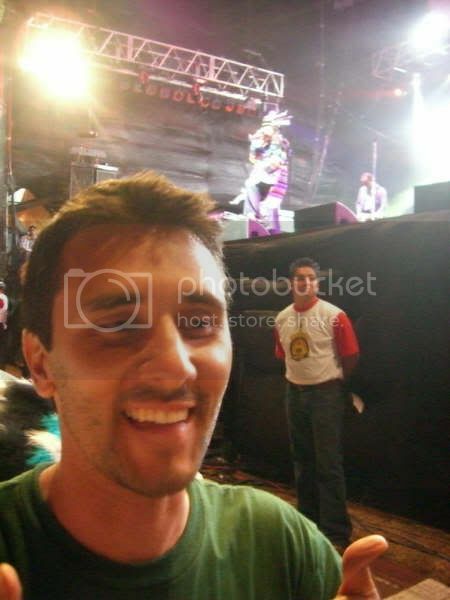 Yo lastimosamente esta un pokito atras pero aun asi mi novio me subio en hombros apenas que entraron y cuando tocaron Seven days in sunny june, y Dynamite. Lo que pasa es que note un toke, que solo yo cantaba, pero fijo la gente de en frente de la tarima si estaba cantando un monton. ME ENCANTO QUE BESARA LA BANDERA DE COSTA RICA Y QUE NOS DIJERA QUE BUENA SURTE EN EL MUNDIAL, CON ESO SE NOTA QUE ELLOS SABEN DE COSTA RICA. Yo no aguanto ni las piernas, ni los brazos y mi camisa del Space Cowboy quedo casi negra, pero aun asi DISFRUTE A MAS NO PODER. Jajajaja cuando estaba en el parqueo ya saliendo, vi a la familia con las camisas, baje la ventana y les grite toda emocionada. Pero bueno ESPEROO QUE LEAN ESTE FORO Y QUE VEAN QUE AKI LOS ADORAMOS. WE LOVE YOU GUYS, YOU ARE THE BEST BAND IN THE WORLD. ALL THE MUSICIANS ARE GREAT AND FLAWLESS, AND WHAT CAN I SAY ABOUT JAY KAY, YOU RULE MAN AND NO DOUBT THAT YOU ARE O HOOOOOOOOT. COME BACK TO COSTA RICA, I SWEAR THAT YOU WONT REGRET IT. I still can't belive that I was in the excelent concert of the saturday, it was great, I enjoy it very much. The energy of the band is unbelievable, I am so happy, tanks for the great show, I'll never forget it. Please come back again, we will miss you. Unbelievable, from out space, it was the best night ever. To us whom love this music was simply unbelievable. Please know that this is your home now that this corner of the earth belongs to you too.